I’m often amazed by the discussions–or absence of discussions on differentiation. In order to win, we have to differentiate our solutions, but we have to differentiate them in the areas the customer cares about. Most of the time, it’s long lists of features, comparing our solutions to the competition–with the goal being more boxes checked in our column than the competitors.’ We overwhelm and confuse customers with long lists of features, benefits, and whatever we can. But when we differentiate ourselves, it’s critical to focus on what the customer cares about. Everything else is meaningless–in fact wastes the customer’s time. Let’s look at the example below. 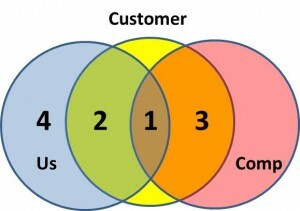 We can represent the customer’s needs and requirements as the center yellow circle. We can represent our capabilities as the blue circle, and the competitor’s as the red circle. We probably never address 100% of our customers’ requirements. Neither do our competitors. If one of the other of us did, customer decision making would be much easier, but in reality no one ever does meet 100% of the customer requirements. Both we and our competitors address a certain number of common customer needs (1-in the illustration). We aren’t differentiated in that area, so we are wasting our time and the customer’s time focusing on those issues. We are differentiated in area (2), our competitors are differentiated in area (3). First, we have to prioritize the customer’s needs and requirements. We have to understand what’s important to them and why. Looking at the illustration, we are differentiated and advantaged in area 2. Our competitor is differentiated and advantaged in area 3. Second, we have to understand their perceptions and attitudes about our solutions and the alternatives. How well do we address the needs, how well does the competition (or alternatives)? The degree to which the customer’s priorities are in areas 1 and 2, advantage us. 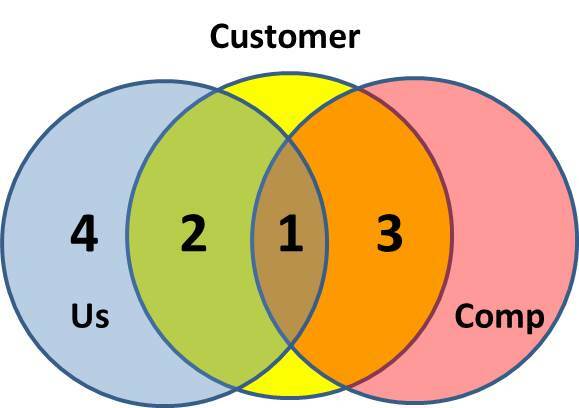 The degree to which the customer’s priorities are in areas 1 and 3, then our competitors are advantaged. If we can’t influence our customer’s priorities, shifting them into areas 1 and 2, our probability of winning is very low. If the customer doesn’t view their requirements in area 2 as the most important, then we aren’t differentiated, at best we are equal to our competitors. But what about area 4 in the illustration? 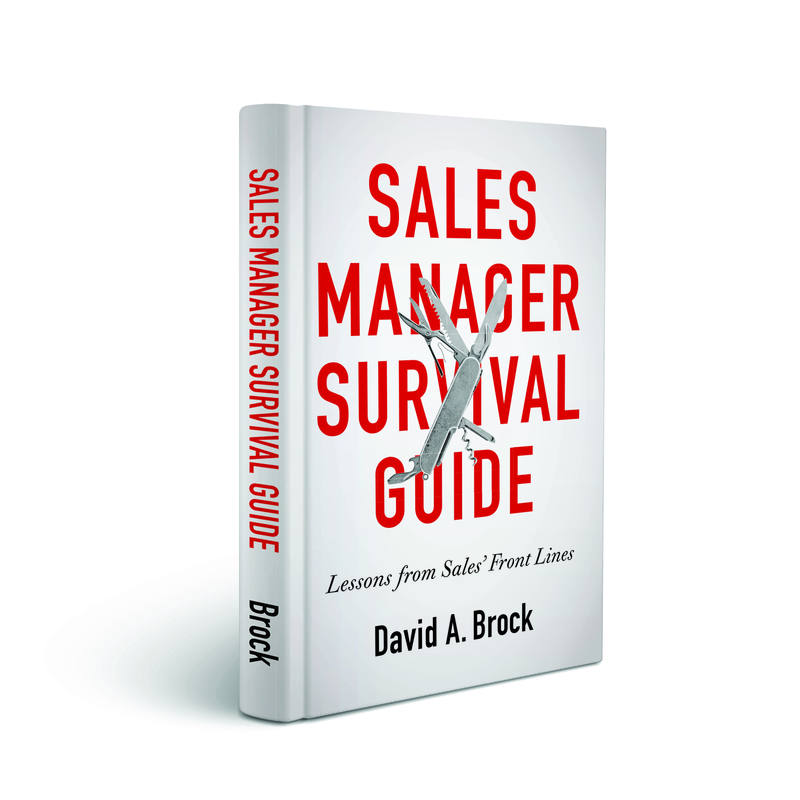 It’s an area that we have to be careful about, but where too many sales people make serious mistakes. Perhaps we can get the customer to look at the problems differently. Perhaps we can get them to expand their needs–identifying area in (4) that are important–moving them into (2). 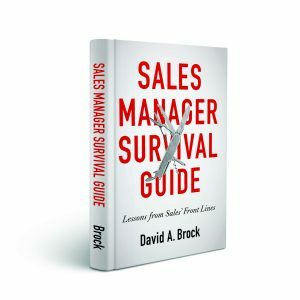 It’s a great strategy, but we have to do this early in the sales cycle–perhaps it’s the insight we bring the customer. Perhaps it’s the thoughtful conversations early in their buying cycle, just as they are determining their needs, requirements, and priorities. The error we make, is not understanding, driving, or helping the customer define their requirements or priorities. The error we make is getting engaged too late, when they’ve already set their priorities. Yet, we waste their time, and ours, by parroting our long list of features, functions, and capabilities. They care about (1) and (2), but (4) is meaningless and wastes their time. 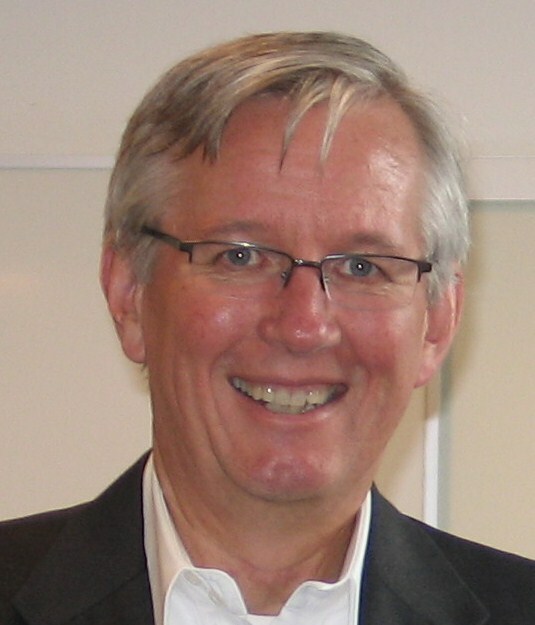 Do you understand your differentiation–from the customer’s point of view? Are you influencing the customer in the right ways, to maximize your ability to differentiate yourself? Are you helping the customer shape their needs and priorities? or our ability to INTEGRATE with the Customer? with the Customer’s Value Generation Process. Doing what the Customer wants done, with our offer. Great point Brian—you are getting me thinking about a follow up post! 1. How should we deal with the situation when the customer refuses to accept a differentiation .e.g. in one of my last organisations the raw materials were carefully selected – stringent checklist which our competitors were not doing so we were a notch better in quality & also expensive than the competition . The customer would tell me that it doesn’t matter & what matters is price. ( Many times the customers are not honest & may resort to false information / not being candid about their opinions/ perceptions. How would you deal with this. 2. If the sales person is targeting ” replacement business” i.e. the customer is using solution by competitor which we have to replace, how do we differentiate ? Prashant: Your questions cover a lot of territory, I’ll handle them briefly, but you might consider searching the blog, I’ve written about these issues quite a bit. Implicit in your questions is “product based” differentiation. But there are many other area in which we can differentiate our offerings to the customer. We do this through the buying experience, their experience in using the products, how easy we make it to buy, and many other things. If we look at true commodities, chemicals offered by different companies are no different. Yet we see suppliers commanding superior prices for exactly the same product–all of this is driven by non-product differentiators. In the replacement business, we are trying to get the customer to make a change decision. We have to address the issue of “why change.” If we are competing purely on products bases, the only differentiation is on price, so to get them to change, we have to offer a lower price. But if we change the basis of differentiation, for example, looking at supply chain management, we can offer a pricier offering that solves a far broader problem and win.